I have found only two books that mention the ladder. Both connect it to the Status Quo, a firman (i.e., an edict) issued by the Ottoman Sultan In 1757, and reaffirmed in 1852, that defined the rights of the six religious orders within the church.5 The Status Quo, still in effect today, defines exactly which parts of the church belong to which group, a subject which has been the source of great controversies over the centuries. Close up view of the upper part of the entrance with the ladder on the right. June, 1990. 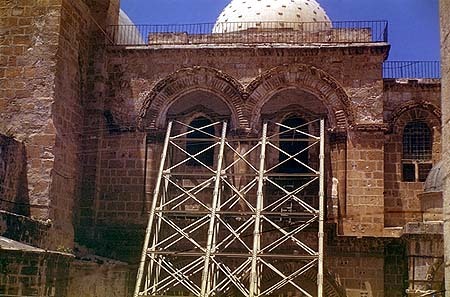 The source continued: "[The] problem stems from the fact that the two windows above belong to the Armenians and they have the right to clean and repair them, and the cornice on which the ladder rests belongs to the Greek Orthodox. 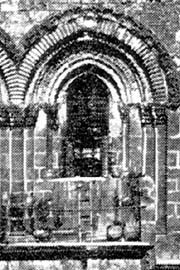 At some point (last century) the Armenians put out the ladder for the purpose of doing work on the windows, [and] the Greeks protested that the ladder was resting on their portion. The Armenians refused to remove the ladder - hence the frozen reality." Close up view of the window and ladder. December, 1992. "The only one to have looked into the background of the ladder was David Daure, who used to be bureau chief of Agence France Presse here but who is now retired. "I remember him telling me that the ladder was first introduced at a time when the Ottomans taxed Christian clergy every time they left and entered the Holy Sepulchre. The clergy who served the church reacted by leaving the church as rarely as possible. They set up living quarters within the church. "The window, ladder and ledge all belong to the Armenians. 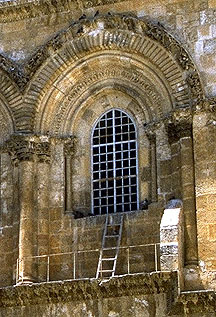 The ledge served as a balcony for the Armenian clergy resident in the Holy Sepulchre, and they reached it via the ladder. It was their only opportunity to get fresh air and sunshine. At one stage, apparently, they also grew fresh vegetables on the ledge. The images below are close-ups of the balcony and ladder taken from the Stoddard and Holy Fire photographs in the Historic Photo Gallery. These, as well as the close-up photos on page 1, all show pots set on the balcony. Were these pots used to grow vegetables? The Stoddard photo (left) and Holy Fire photo (right) both show pots next to or behind the ladder. 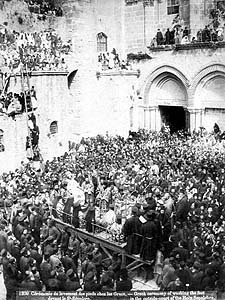 The quote above from Cust points out how the Armenians use the balcony where the ladder rests 'on the occasion of the festival ceremonies that take place in the Courtyard.' One such ceremony is the washing of the feet that occurs each year in conjunction with Easter. The undated photo below (left) and the enlarged view of the entrance (right) show the crowd filling the courtyard and occuping every cornice and balcony, including the one with the ladder, during the foot washing ceremony. 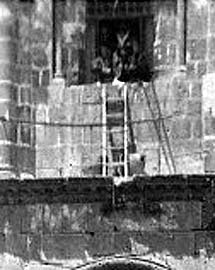 There seems to be a consensus on a couple of facts: (1) the ladder is there because of the Status Quo, and (2) the window belongs to the Armenians. However, there seems to be some disagreement about who controls the balcony - Greeks or Armenians - and why the ladder is there, i.e., to clean the windows or give the Armenians access to the balcony? Or is there another, yet-to-be-discovered, totally different explanation? 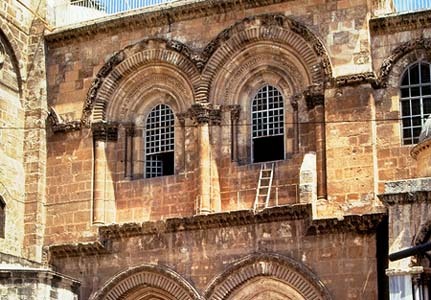 The next time you're in Jerusalem and visit the Church of the Holy Sepulchre look for the ladder. If it's still there you'll know the Status Quo is still in effect. 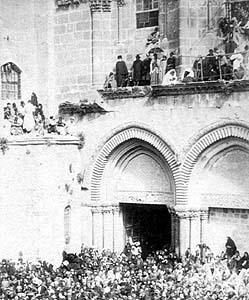 In a new book on churches in Jerusalem, Aviva Bar-Am tells about the ladder in her section on the Church of the Holy Sepulchre.10 When describing the entrance to the church, she writes, "Note the ladder under one of the second story windows. It was used over a century ago for hauling up food to Armenian monks locked in the church by the Turks. With the statu[s] quo still in force, the ladder seems destined to remain there forever!" 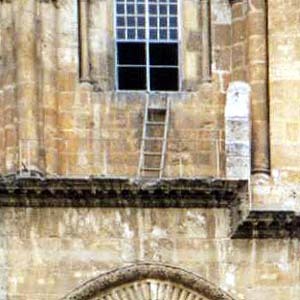 A recent photo taken in front of the Church of the Holy Sepulchre by R. Malcom Brown of the University of Texas shows the ladder and a change in the window above the ladder.11 A grate has been added to the window to keep people from reaching the ladder when the window is open. The entrance to the Church of the Holy Sepulchre was a favorite subject for 19th century photographers in Jerusalem. Most old photos show the ladder. Visit the Historic Photo Gallery to view a few examples. 1. This painting is viewable on the web. See "The Entrance To The Church Of The Holy Sepulcher (1862), Werner (1894-1808)"
2. See "Celebrating Jerusalem" by James Lancaster in Queries and Comments, Biblical Archaeology Review, March/April 1996, page 18. 3. For more about David Roberts see the web page "The Travels of David Roberts (1796-1864)"
4. Roberts, David, The Holy Land, Studio Editions, London, 1989, Plate 1. This painting is also viewable on the web. See "Entrance to the Holy Sepulchre - Title Vignette"
5. The six are the Latins, Greek Orthodox, Armenian Orthodox, Syrian Orthodox, Copts and Ethiopians. 6. Elon, Amos, Jerusalem, Battlegrounds of Memory, Kodansha America, 1995, page 201. 7. Gidal, Nachum Tim, Jerusalem In 3000 Years, Knickerbocker Press, Edison, New Jersey, 1995, page 24. 8. Due to sensitivities regarding the ladder and the Status Quo, the sources cited here must remain unidentified. 9. Private correspondence from Jerusalem, October 14, 1996. 10. Bar-Am, Aviva, Beyond the Walls: Churches of Jerusalem, Ahva Press, Jerusalem, 1998, page 56. 11. R. Malcom Brown has a web page with 88 photos from a trip to Israel in January, 1999. The photo showing the ladder is #36.